Theresa's Haunted History of the Tri-State: Seven Lives to Go? It's been awhile since I've really done a Friday Night Funny post! 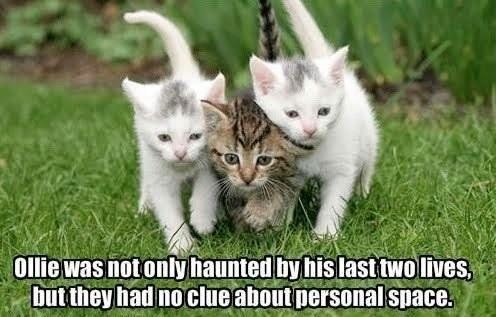 I'm not ready to make it a weekly thing, but I can't help sharing some paranormal humor once in awhile, especially when its this freakin' adorable! There has been a lot of negativity as of late in the paranormal community and even in the world as a whole. I've actually left several Facebook groups this month alone because I've been so sick of seeing people fight over silly things, letting their egos get in the way, and backstabbing the crud out of others in the community. General d-baggery is at an all-time high and its hurting the integrity of paranormal study. Sometimes we all need to just take a deep breath and chill out with some precious lil' kitty pictures! The paranormal community is filled with wonderful, caring people who will overcome this short period of negativity with no problem, though. Unlike this little guy, we've only got one life---live it to its fullest and make it count!